Instant coffee is gaining popularity among consumers from past few years. Thanks to the convenience of making coffee from instant coffee is boosting its demand globally. This demand is reflecting positively on the global instant coffee market. Additionally, the easy availability of instant coffee through the various sales channels is contributing in the growth of the market globally. Furthermore, instant coffee is gaining popularity amongst the common people among urbanized cities and economically growing countries. Growing disposable income of the people is enhancing their capability of spending on preferred instant beverages, which is propelling growth of the global instant coffee market. Additionally, ever evolving lifestyle and growing consumption patterns globally is driving the growth of the instant coffee market. Easy preparation of instant coffee wide variety of flavors is driving the growth of global instant coffee market. Moreover, higher shelf life of instant coffee owing to powdered texture is propelling growth of the global instant coffee market. Most of the popular instant coffee brands are focusing on the advertisements, which results to boost the global instant coffee market. 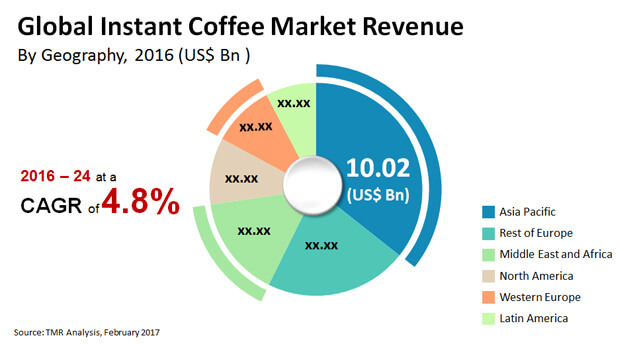 TMR estimates, the instant coffee market stood at the value US$28.12 bn in 2016 and is expected to attain value of US$42.5 bn by the end of 2025. The market is expected to expand with a CAGR of 4.80% from 2017 to 2025. This growth is attributable to the growing awareness about the effects of aerated drinks, which is encouraging adoption of the instant coffee. Based on the distribution channel, the instant coffee market is segmented in to B2B and retail stores. Based on the B2B sales, the market is further segmented into such as hotels, restaurants while retail stores market is segmented in to online, and offline. Of these, retail stores segment dominated the global instant coffee market in 2016. Owing to the availability of a range of instant coffee and attractive offers and discounts, the market is witnessing significant growth over the forthcoming years. In terms of geography, the global instant coffee market is segmented into North America, Latin America, Europe, Japan, the Middle East and Africa, and Asia Pacific excluding Japan. Of these, Asia Pacific dominated the global instant coffee market in the year 2016 by accounting 35.7% share in the overall market. This growth is attributable to the rising number of instant coffee consumers across the developing regions of Asia Pacific such as India and China. However, the consumption of tea in the regions is challenging growth, but easy preparation method of instant coffee is aiding growth of the market extensively. Europe stood at the second position in terms of the revenue due to high demand from the countries such as Poland, Bulgaria, Russia and Rest of the Europe. This demand from these countries is likely to remain same over the years to come. The instant coffee market features consolidative vendor landscape. Some of the leading players in the instant coffee market are Nestlé S.A., Jacobs Douwe Egberts, Starbucks Corp., Tata Global Beverages, and Unilever Plc. There has been a positive change in lifestyle of people in developing nations, with youngsters heavily adopting the western culture. Countries like India, China, and a few Middle Eastern countries are seeing a transition to heavy consumption of coffee over tea. Consumers with life style seek beverages that can be easily prepared and are pocket-friendly as well. Instant coffee not only maintains the aroma and flavor of the drink but also gives a branded experience to consumers. The impact of this driver is medium in the short run and is expected to be high by the end of the forecast period. Increasing competition in the global market is driving leading companies to undertake intensive research and development. In order to have a balanced product portfolio in the market, leading players like Starbucks and Nescafe are constantly innovating and trying to deliver a brand rich experience to consumers. The Fair Trade concept of producing coffee in underdeveloped countries is also adding to the competition in the global market. The convenience of preparing the drink due to the ease in its availability has driven the market for this product heavily. Traditional coffee or whole bean coffee machines are usually implanted in most of the households of the major coffee drinking nations. On a recent research, UK has contributed to highest instant coffee consumption in the Western Europe. Instant coffee is easy to prepare and there is no hassle of disposing off the waste, as in the case of the filter coffee. Moreover, the introduction of instant coffee in the market by leading players such as Nestle, Jacobs Douwe Egberts and others are promoting the usage of sachets and jars that will be convenient in preparing coffee quickly. Millennials are driven by convenience and quality products even in India and China, and they are ready to pay a higher price for a rich experience. However, Instant coffee faces a major setback due to the consumption pattern among the population in geographical regions such as North America, Western Europe and Latin America preferred filter coffee over instant coffee. Consumers in this countries prefer filter coffee because of their traditional habit of accepting coffee as a drink that has the true properties of it as a caffeinated beverage. Furthermore, the hassle of preparing filter coffee from the whole bean is hefty, but the original flavor and aroma lies in the espresso shot which comes from the coffee machines, usually installed in most of the households and other industrial areas in these countries. Due to these factors, the impact of this restraint is high currently and is expected to be medium by the end of the forecast period. The global instant coffee market is segmented into two types of packaging- Jars and sachets. In terms of distribution channel the market segmented by B2B and retail. B2B distribution channel is further segmented by hotels, restaurant and others. Retail distribution channel is further segmented by online and offline. Offline retail distribution channel is segmented by departmental store, super and hyper market and others. In order to get a better understanding of the global instant coffee market, a key trends analysis has been included for all the segments. In addition, the market players in the instant coffee market have also been profiled. The leading players in the market include. Nestle S.A. (Vevey, Switzerland), Starbucks Corporation. (Seattle, Washington, U.S), Jacobs Douwe Egberts (DK Amsterdam, Netherlands), Strauss Group Ltd. (Petah Tikva, Israel), Matthew Algie & Company Ltd (London, U.K), The Kraft Heinz Company (Illinois, U.S.), Tata Global Beverages (Kolkata, West Bengal), Tchibo Coffee (Hamburg, Germany), Keurig Green Mountain. (Vermont, U.S.) and Unilever Plc. (London, U.K.) among others.